This was the response Nicky Fitzgerald gave to me, when I asked for her opinion on a running tourism project I was working on with the Kalenjin tribe of Kenya. I had just met Nicky in Seattle at an inspiring talk she gave, on the creation of Angama Mara. I could not have been more impressed with her commitment to the environment, the community and the wildlife surrounding the awe-inspiring location of her lodge on the Maasai Mara. Nicky’s depth of experience in both tourism and Kenya is well-known, and I was eager to get her opinion on our project to bring runners from around the world to the impoverished community of Matunget, where they would be paired up with their own personal Kalenjin running coach. That is when she told me about the man with the T-shirt who wanted to run like Kenyan in his next life: “I think you are on to something” she said smiling. Nicky invited me to visit Angama when our project team headed to Kenya to do a site visit. 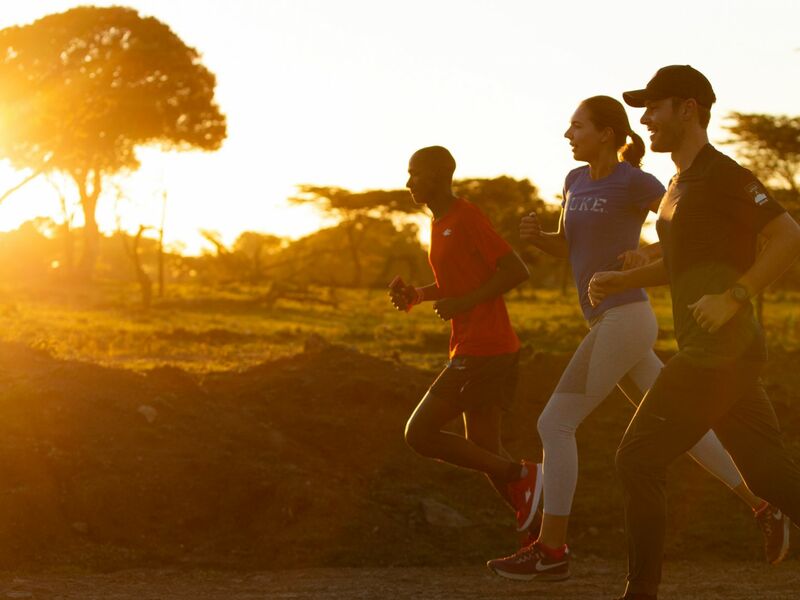 The running tourism project idea comes from Matunget member Abraham Kosgei, an elite runner now living in the US who wanted to figure out a way to give back to his community by utilizing skills they have a-plenty: running. Abraham led our team to Kenya for the site visit, introducing us to his community and showing us the site of the running camp. The nearby town of Iten is famous for training long distance runners, and groups of them were everywhere. Our idea is to connect runners to the community through tourism. The project would provide meaningful employment in the community as well as celebrate the Kalenjin’s unique role in the world as elite runners. We then headed south to Angama, which sits perched on the edge of the escarpment looking down on thousands of roaming animals. One of the runners we had with us, Lance Himmelberger, had been running at every site we went to. As soon as Lance saw the beauty of Angama he wanted to know if anyone on Angama’s staff was a runner. It turned out there was Maasai security guard on the Angama team runner named Robert who took Lance on a run. Upon returning, Lance said the run was beautiful but a bit humbling as Robert ran with an ease he himself could not match. Robert was not even breathing hard as they ran past zebras and impalas along the escarpment’s back roads. Lance gave a big smile as he reflected on the natural running talent of Kenyans. Our running tourism project will take some time before it’s operational as we need to work on the road and build the Kalenjin style accommodations, but the community is excited and there is great momentum behind the project. We are thrilled with the location of the camp which sits at the foot of Torok Falls in the Rift Valley north of Angama in the heart of Kalenjin country. When clients are finished running with the Kalenjin we will be suggesting they head to Angama to see the best of Africa’s wildlife in the most famous area of all: the Maasai Mara. 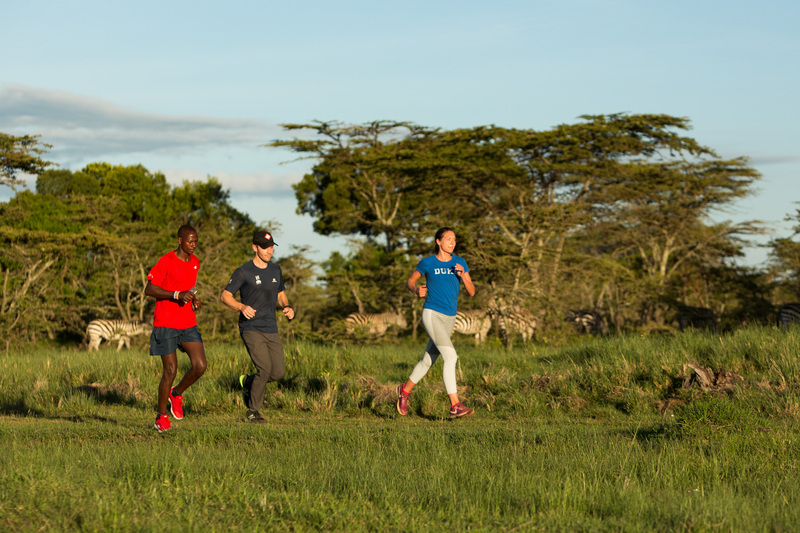 Note from Editor: We were so inspired by Christine’s visit last year that we founded the Angama Running Club and launched our new guest experience Run With A Kenyan. Guests are paired up with one of our runners or join the team’s early morning or late evening training session. Guests can choose the distance they would like to cover but they are warned: Angama sits at almost 2000m above sea level and they will be running with a Kenyan. On their return the guest is presented with a T-shirt: I ran with a Kenyan – and survived. Christine Mackay is the Co-Founder and Executive Director of Crooked Trails and has been working in environmental education and community development since 1980. Chris acts as a consultant to a wide range of organizations on issues such as community-based tourism, nature and wilderness education.